The Sun-Horse, Slavonic - andrea-hofmann308s Webseite! Once upon a time there was a country, sad and gloomy as a grave, on which God's sun never shone. But there was a king, who possessed a horse with a sun on his forehead. Just like the real sun it sent bright rays to all sides, and this sun-horse of the king caused to be led up and down the dark country, from one end to the other, so that the people might be able to exist there. Light came from him on all sides wherever he was led, just as in the most beautiful day; but from where it went away, dense darkness rolled over. All at once the sun-horse disappeared. A darkness worse than that of night prevailed over the whole country, and nothing could disperse it. Unheard-of terror spread among the subjects; frightful misery began to afflict them, for they could neither manufacture anything nor earn anything, and such confusion arose among them that everything was turned jumbled-up. The king, therefore, in order to liberate his realm and prevent universal destruction, made ready to seek the sun-horse with his whole army. Through thick darkness he made his way as best he could to the frontier of his realm. Over dense mountains thousands of ages old God's light began now to break from another country, as if the sun were rising in the morning out of thick fogs. On such a mountain the king came with his army to a poor lonely cottage. He went in to inquire where he was, what it was, and how to get further. At a table sat a peasant, diligently reading in an open book. When the king bowed to him he raised his eyes, thanked him, and stood up. His whole person announced that he was not a man like another man, but a seer. All at once the old witch came into the room, and, seeing the bird, screamed to her daughter, 'Wring the accursed bird's neck, for it's making you bleed!' 'Well, what if it should make me bleed? it's such a dear; it's such an innocent dear!' answered the daughter. But the witch said: 'Dear innocent mischief! here with him! let me wring his neck!' and dashed at it. But the bird cunningly transformed itself into a man, and, pop! out through the door, and they didn't know whither he had betaken himself. Thereupon the witch burst into the room. 'Wring the accursed bird's neck! wring its neck, for it's making you bleed!' cried she as soon as she espied it. 'Well, what if it should make me bleed? it's such a dear, such an innocent dear!' replied the daughter. But the witch said: 'Dear innocent mischief! here with it! let me wring its neck!' and was already trying to seize it. But at that moment the green bird changed itself into a man, ran out through the door, and disappeared, as it were, in the clap of a hand, so that they didn't know whither he had gone. At that moment the old witch came into the room. 'Wring, wring the accursed bird's neck!' screamed she in the doorway, 'for it is making you bleed.' 'Well, what if it should make me bleed, mother? it is so beautiful, so innocent,' answered the daughter. The witch said, 'Beautiful innocent mischief! here with him! let me wring his neck!' But at that moment the bird changed itself into a man, and pop! out through the door, so that none of them saw him more. Now the seer knew where the kings were, and when they would arrive. He went to his servant and ordered him to follow him out of the town. On they went with rapid step till they came to a bridge, over which the kings were obliged to pass. Under this bridge they stayed waiting till the evening. When at even the sun was sinking behind the mountains, the clatter of a horse was heard near the bridge. It was the eldest king returning home. Close to the bridge his horse stumbled over a log of wood, which the seer had thrown across the bridge. 'Ha! what scoundrel was that who threw this log across the road?' exclaimed the king in anger. Thereat the seer sprang out from under the bridge and rushed upon the king for 'daring to call him a scoundrel,' and, drawing his sword, attacked him. The king, too, drew his sword to defend himself, but after a short combat fell dead from his horse. The seer bound the dead king on the horse, and gave the horse a lash with the whip to make him carry his dead master home. He then withdrew under the bridge, and they waited there till the next evening. When day a second time declined towards evening, the middle king came to the bridge, and, seeing the ground sprinkled with blood, cried out, 'Somebody's been killed here! Who has dared to perpetrate such a crime in my kingdom?' At these words the seer sprang out from under the bridge and rushed upon the king with drawn sword, exclaiming, 'How dare you insult me? Defend yourself as best you can!' The king did defend himself, but after a brief struggle yielded up his life under the sword of the seer. The seer again fastened his corpse upon the horse, and gave the horse a lash with the whip to make him carry his dead master home. They then withdrew under the bridge and waited till the third evening came. 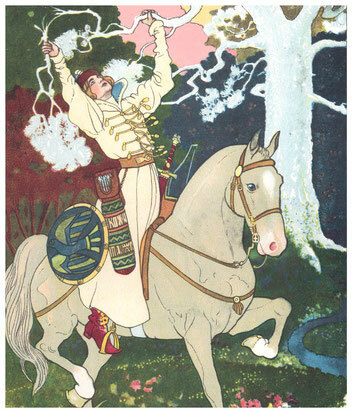 The third evening, at the very setting of the sun, up darted the youngest king on the sun-horse, darted up with speed, for he was somewhat late; but when he saw the red blood in front of the bridge, he stopped, and gazing at it exclaimed, 'It is an unheard-of villain who has dared to murder a man in my kingdom!' Scarcely had these words issued from his mouth when the seer placed himself before him with drawn sword, sternly bidding him defend himself, 'for he had wounded his honour.' 'I don't know how,' answered the king, 'unless it is you that are the villain.' But as his adversary attacked him with a sword, he, too, drew his, and defended himself manfully. It had been mere play to the seer to overcome the first two kings, but it was not so with this one. Long time they fought, and broke their swords, yet victory didn't show itself either on the one side or on the other. 'We shall effect nothing with swords,' said the seer, 'but do you know what? Let us turn ourselves into wheels and start down from the hill; the wheel which breaks shall be the conquered.' 'Good!' said the king; 'I'll be a cart-wheel, and you shall be a lighter wheel.' 'Not so,' cunningly said the seer; 'you shall be the lighter wheel, and I will be the cart-wheel;' and the king agreed to it. Then they went up the hill, turned themselves into wheels, and started downwards. The cart-wheel flew to pieces, and bang! right into the lighter wheel, so that it all smashed up. Immediately the seer arose out of the cart-wheel and joyfully exclaimed, 'There you are, the victory is mine!' 'Not a bit of it, sir brother!' cried the king, placing himself in front of the seer; 'you have only broken my fingers. But do you know what? Let us make ourselves into flames, and the flame which burns up the other shall be the victor. I will make myself into a red flame, and do you make yourself into a bluish one.' 'Not so!' interrupted the seer; 'you make yourself into a bluish flame, and I will make myself into a red one.' The king agreed to this also. They went into the road to the bridge, and, changing themselves into flames, began to burn each other unmercifully. Long did they burn each other, but nothing came of it. Thereupon, by coincidence, up came an old beggar with a long gray beard, a bald head, a large scrip at his side, leaning upon a thick staff. 'Old father!' said the bluish flame, 'bring some water and quench this red flame; I'll give you a penny for it.' The red flame cunningly exclaimed, 'Old father! I'll give you a shilling if you'll pour the water on this bluish flame.' The old beggar liked the shilling better than the penny, brought water and quenched the bluish flame. Then it was all over with the king. The red flame turned itself into a man, took the sun-horse by the bridle, mounted on his back, called the servant, thanked the beggar for the service he had rendered, and went off. In the royal palaces there was deep grief at the murder of the two kings; the entire palaces were draped with black cloth, and the people crowded into them from all quarters to gaze at the cut and slashed bodies of the two elder brothers, whose horses had brought them home. The old witch, exasperated at the death of her sons-in-law, devised a plan of vengeance on their murderer, the seer. She seated herself with speed on an iron rake, took her three daughters under her arms, and pop! off with them into the air. After a time they came to a spring; water clear as crystal bubbled up in it, all but running over the brim and thus attracting wayfarers. 'Ah!' said the servant, 'if we can't get anything better, let us at any rate have a drink of this good water.' 'Don't venture to drink of it!' shouted the seer; 'but stay, I'll get you some of it.' Yet he didn't get him any water, but thrust his drawn sword into the midst of it; it was immediately discoloured with blood, which began to flow from it in mighty waves. 'That is the middle queen, whose mother placed her here to put us out of this world,' said the seer, and the servant thanked him for his warning, and went on, would he, nould he, in hunger and thirst, whithersoever the seer led him. They moved on. As they moved on, the seer spoke to the servant: "We survived the worst danger, we are out of Striga's territory. But we must not trust, for Striga will instigate other powers." As soon as he had spoken the words, a small boy came along the way, carrying a bridle in his hand. He jumped under the horse, touched it with the bridle and in this very moment, the seer came down from the Sun Horse and the boy sat on top and darted away. "Did I not say so?" spoke the seer. - "What kind of boy is this?" shouted the servant. "Who would do such a prank? Let's see that we catch up with him!" - "Let’s go," replied the seer, "I will catch up with him by myself! Meanwhile you go your way, move confidently through six countries, until you get to the borders of your country, I will catch up with you." The seer left the servant and hurried behind the little sorcerer. After a while he caught up with him, and moved slowly by taking the shape of a common wanderer. The sorcerer just looked around. "Where from, friend?" he asked the wanderer. "From great distance." - "And where to?" - "Looking for a duty." - "Looking for a duty? Do you know how to care for horses?" - "Oh yes." - "Then come to me and care for this horse. I will pay you well." - "Why not!" said the wanderer, and so the seer became the sorcerer's servant. They reached home. The seer took good care of the Sun Horse, so his master was content with him. It only irked the seer that he did not find a possibility to flee; for the sorcerer prevented it with his sorceries. Nevertheless he did not discover who his servant was, because he was too busy, thinking about how he could get the beautiful princess, who lived in a castle that stood on a pillar in the ocean. He had already tried various approaches, good and bad, but nothing ever worked. "Up!" he once spoke to his servant, "go to the ocean. In the ocean you will see a tremendously big pillar, on it lies a beautiful castle. In the castle lives a princess; if you bring her to me, I will reward you plentiful, if not, it will fare you bad." The master commanded it; and the servant had to carry it out, at least try to. He got a boat, loaded it with colorful ribbons and fabrics, and drove as a trader to the castle on the pillar. As he approached the pillar, he hung out the most beautiful fabrics and ribbons, so one could see them from the castle. They soon attracted the princess' attention, who was looking out the oriel. "Go down to the boat," she commanded her maid, "and seek out, if they not want to sell you of these beautiful fabrics and ribbons." The maid went down. "I don't sell anything," said the trader, "unless the princess herself gets down here, and chooses herself." The maid delivered these words, and the princess came, chose from the most beautiful fabrics and ribbons and bargained, and did not notice, that the smart trader pushed the boat and drove to the shore. As she wanted to get off the boat, she noticed what had happened. "I know where you are bringing me to," she said. "You are bringing me to the sorcerer, who already so often endeavored for me in vain. Well, God commanded!" As the seer saw that the princess was not inclined to the sorcerer, he began to softly persuade her, she may earn his trust, so she could learn where his powers lay; he would then help her to get free. As the servant brought the princess to the master, his joy was inexpressible, and as she showed him love, he was completely out of his mind. He would have given her anything, would have done all to her will; so no wonder, that he – after much of her asking – also revealed his secret. "In those woods over there," he spoke, "is a big tree; under the tree grazes a stag, inside the stag is a duck, inside the duck is a golden egg and in the egg is my power; because my heart is in it." As the sorcerer entrusted this under the seal of the strictest secret to the princess, she went and told the seer. The seer did not need more. He armed himself and went to the woods. He found the big tree, he found the stag that was grazing under the tree. He aimed and shot, and the stag fell. Then he ran there, took the duck out of it, out of the duck he took the egg, drank the egg and the sorcerers strength was gone. The sorcerer became weak, like a child, because all his strength was passed over to the seer. He now let the princess go back to her palace, took the Sun Horse, swung himself onto it and hurried with it to its owner, the king. He had to hurry through a good part of the world, before he got to the border of the dark realm, where he also met his former servant. As they crossed the border, the rays of the Sun Horse poured out and enlightened the country far and wide, which had been coated in darkness for so long. The hearts of the troubled people were delighted. Everything came to new life, the meadows rejoiced and blossomed with the flowers of spring and people flowed in to thank their benefactor for the rescue. The king didn't know how to thank the seer sufficiently, and offered him the half of his kingdom as a reward, but he declined it. You are king,' said he; 'rule over the whole realm, and I will return to my cottage in peace.' He took leave and returned to his hut.